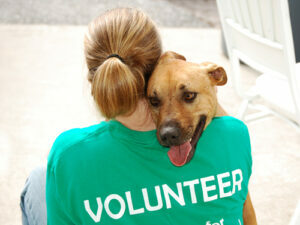 Volunteer - Save-A-Life, Inc.Save-A-Life, Inc.
Save-A-Life always needs pet-loving volunteers. It is our volunteers who have kept us going for over 40 years. Love to share your heart and home with an abandoned or abused pet? We always need volunteers to foster. Can’t foster but love dogs? We can always use dog-walkers and dog-holders during our mobile adoption hours. Enjoy interacting with the public? Consider being an adoption counselor or desk worker during our mobile adoption hours. (Two hours a Saturday or more a month-we are flexible!). Love cats and have a few minutes during the day? We need persons to monitor and play with the cats in the cages at PetSmart. The schedules are flexible. Are you a skilled organizer? How about organizing a special fund raising event for us? What about photography skills? We could use some help during mobile adoption to take pictures of our adoptable animals and to post them on the web. Hectic schedule? We can use some help answering our information line. It can be done from your home phone and we train you. Like to write? We can always use articles for the newspaper or better yet-how about publishing our own newsletter. You tell us!! If you love animals and have some time to give, we can use you! The minimum age to volunteer for Save-A-Life is 18. FILL OUT THE VOLUNTEER’S PROFILE APPLICATION AND BRING IT TO PETSMART OR SUBMIT IT ONLINE (VOLUNTEER APPLICATION).